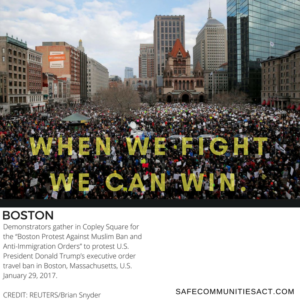 Despite Legislative reticence, the political support for Safe Communities Act is strong. People have filled the streets in support of immigrants, against Trump’s overreaching campaign of fear. And today, the Massachusetts Chiefs of Police Association and the Massachusetts Major City Police Chiefs Association have both unanimously endorsed an amended version of the bill, in consultation with the bill sponsors. Safe Communities Act is about community safety. It’s about the fundamental principles that underlie community policing: building, and earning, trust, not sowing fear. There will be much to debate in the weeks to come, but this is not up for discussion: we have not had a more toxic and dangerous moment in American politics in decades. If Massachusetts law enforcement understands the urgent need for Safe Communities, what is the Legislature waiting for? Join us in organizing … and making calls! What will it atke for Mass. Legislature to act?